Bright, vibrant, sweet, spicy and healthy to boot. Is there a better cuisine then Vietnamese? One of the best things about any trip to Vietnam is the exquisite food. From street side noodle stalls by the beach in Hoi An to fine dining along the side of the West Lake in Hanoi – the delicate tastes created across the country are not only unique but arguably some of the healthiest cuisines in the world. The country’s natural geography with paddy fields in the north, a coastline running the length of the country and a tropical climate in the south has determined many of the cuisines ingredients. Fish sauce, shrimp paste and freshwater fish are plentiful and spices and herbs chilli, lemongrass, lime, Thai basil and coriander are used generously. Rice is the staple – certainly in the south – although rice noodles and bread (mostly made from rice flour) are also common. As well as its physical geography, its political geography has meant that it has also assimilated some of its neighbours’ cuisines into its own. Spicy chilli soups from Cambodia and Thailand, fried rice and dumplings from its north Chinese neighbour. Fish pastes, coconut milk and curries from Indonesia and Malaysia. 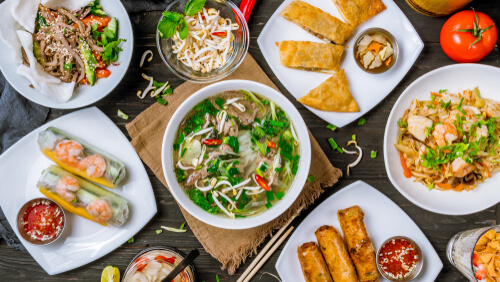 As well as a range of flavours, Vietnamese cuisine is also valued on its vibrancy of colours. Spicy red soups, fresh green herbs and light white meat may well all be found combined together in a simple bowl of noodles. And like in much of Asian cuisine a Yin-Yang balance is sought after for a healthy lifestyle. The five flavours (sweet, sour, bitter, spicy and salt) correspond with the five elements (earth, wood, fire, metal and water). These in turn have relations to the human organs, senses and are depicted in colours. Meals might start with rolls. The skins are made with an almost translucent rice flour pancake, wrapped around a variety of pickled and fresh vegetables, chillis, coriander and either shrimp, mushroom or thinly shredded pork. 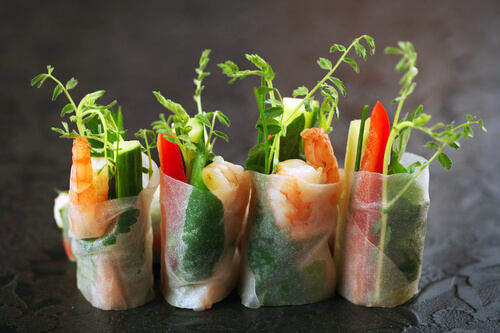 Called goi cuon and known as salad rolls or summer rolls they are served with either a chilli or peanut dip and vary enormously in both their style and ingredients depending on the region. Their naughty-but delicious deep fried cousin, called cha gio are also easy to find and more likely to be paired with a chilli dipping sauce. Banh cuon Ba Hanh in Hanoi serves fantastic northern rolls stuffed with woodear mushrooms. 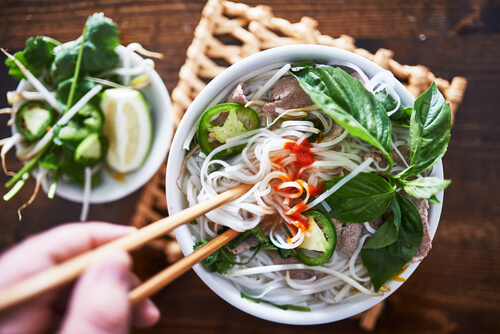 Another of the most internationally recognised dishes are the noodle soups, pho (pronounced like the English ‘fur’) that are usually made with boiled chicken or beef as well as coriander and spring onions. But pho are just one of many noodle soups. Bun mang vit is made with bamboo and duck meat. The more adventurous might try bun oc made with vermicelli and snails. The Chinese-style mi bo vien comes with egg-noodles and meatballs, whereas the pho sate has the familiar spicy peanut taste of Indo-Malaysian (known locally as Cham) food. Street noodles are always the best, eaten late at night, on a plastic stool on the street. Try the noodles at Hoi An’s central market. Seasons of Hanoi is a romantic restaurant on Hanoi’s West Lake that has many Chinese inspired northern Vietnamese dishes to die for. The more recent French influence has also remained. 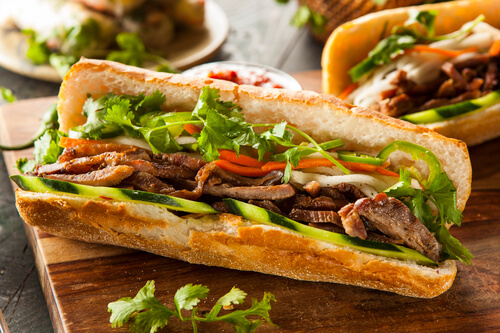 Banh mi is a French baguette stuffed with meat and vegetables, not entirely dissimilar to something that could be found in a sandwich shop across Europe. Usually they are stuffed with pork and pickled vegetables but it’s not uncommon to find a banh mi with a nice local pate, a friend egg or mayonnaise – another colonial influence. As the flour is usually made with rice flour or a mix or rice and wheat flour the baguettes are very light and fluffy with a nice crust. The best place to pick up banh mi is on the side of a street before 9am but to see where the cool cats hang out try the fish cake banh mi in Propaganda in Ho Chi Minh City. Many Chinese influenced rice dishes have also become mainstays in Vietnamese cuisine. Fried rice dishes – served with chicken or beef in the inland areas and clams or fermented fish in the coastal areas – are ubiquitous up and down the county. Steamed buns stuffed with meat, vegetables or eggs are another Chinese import, as are wheat and fried noodles. Often thought of as a Thai dish goi du du is a spicy papaya salad with fried shrimp. Vietnamese salads are fresh, crunchy and often have a fiery kick. They might be served with beef, pork, chicken or they may turn up with duck feet, jellyfish or eel. They will normally all however have a variety of fruit in them and doused generously with vinegar. Most food in the evening is best washed down with a nice cold Bia Hanoi or a Saigon Green beer but it’s coffee that the Vietnamese go gaga over. The French may have introduced it but the Vietnamese have taken it to an art form. Coarsely ground beans are put through a French drip filter, usually pressed down with a weighted lid to extract all the eye-wateringly strong juice. Then a generous dollop of sweetened condensed milk is added, which means the impending caffeine and sugar hit will certainly keep you on your feet for the rest of the afternoon. Tinned condensed milk was used first by the colonial French who struggled to get fresh milk. But why stop at condensed milk, coffee is now added to everything from yoghurt (another French import) to egg whites (think tiramisu meets crème brulee) to smoothies (coffee and avocado smoothie anyone?). 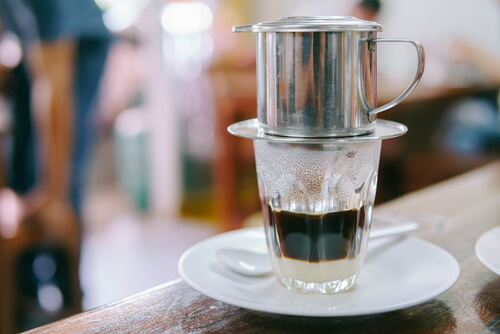 Hanoi’s Hai Ba Trung district is chock-a-block with coffee houses and you’ll find hole in the wall family shops next to new trendy cafes where the cool kids go on Coffee Street (Trieu Viet Vuong). But no trip to Vietnam is complete without at least one eye watering coffee experience.